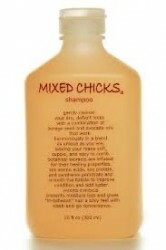 Mixed Chicks shampoo gently cleanses your straight, wavy or curly hair leaving your hair full of luster. Improve the health of your hair by using other Mixed Chicks hair products including condition & detangle along with style & control. Click the button below to add the Mixed Chicks Shampoo to your wish list.